For those who suffer from osteoarthritis, pain has become a part of every day life. In some cases, total knee replacement may be the best option for relief. But many individuals may not take that step, fearing further limitations in their daily activities. A new total knee replacement implant can help put those concerns to rest. The NexGen® Complete Knee Solution LPS-Flex Fixed Bearing Knee offers a new option for those osteoarthritis patients who want to continue their active lifestyle after total knee replacement. For patients with the ability and desire, the Flex Fixed Knee is designed to accommodate resumption of deep knee bending activities. Early diagnosis, good preoperative flexibility and appropriate rehabilitation (physical therapy) can help a patient's chance for success. This information is part of a public awareness campaign, "Keeping pace with life," designed to educate patients about the new Flex Fixed Knee as an option for total knee replacement. The campaign goal is to provide patients with information and insight into the leading edge treatment for joint replacements to help them make educated decisions about their course of treatment. A. As the most common form of arthritis, osteoarthritis is a degenerative joint disease that causes deterioration of cartilage between bones. Factors that may cause the development and progression of the disease include aging, genetics, obesity and joint injuries from sports, work or accidents. There are an estimated 21 million people in the United States who suffer from osteoarthritis. A healthy knee is designed to move and endure the forces of everyday activities. Cartilage that covers the ends of our bones acts like a cushion or shock absorber to prevent joints from grinding. 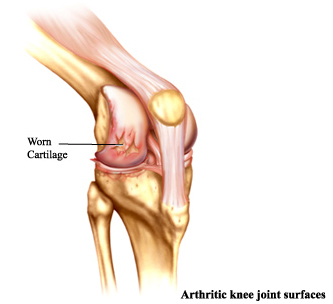 For those who suffer from osteoarthritis of the knee, the cartilage of the affected joint is roughened and becomes worn down, causing the bone ends to rub against each other. 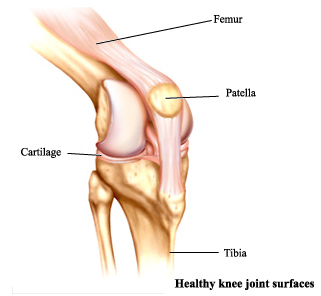 Osteoarthritis usually affects the weight bearing sections of the knee, which include the junction of the lower leg bone (tibia) with the upper leg bone (femur), and beneath the kneecap (patella). The disease may affect only one section of the knee, leaving the two other sections relatively healthy. While anti-inflammatory drugs, cortisone injections, and physical therapy are short-term solutions to managing the pain, many people eventually require knee replacement surgery. Q. What symptoms should I look for with osteoarthritis? A. Individuals with osteoarthritis may experience aching, stiffness and eventual loss of mobility within the knee joint. Inflammation may or may not be present. The pain may be severe at times, followed by periods of relative relief. It often worsens after extensive use of the knee and is more likely to occur at night than in the morning. Stiffness tends to follow periods of inactivity, such as sleep or sitting and can be eased by stretching and exercise. Pain also seems to increase in humid weather. As the disease progresses, the pain may occur even when the joint is at rest and can keep the sufferer awake at night. Q. What tests will confirm the diagnosis of osteoarthritis? A. Osteoarthritis is often visible on X-rays. Cartilage loss is indicated if the normal space between the bones is narrowed, if there is an abnormal increase in bone density or if bony projections or erosions are evident. A blood test for rheumatoid is often taken to rule out rheumatoid arthritis. Your surgeon will conduct an examination of your knee, including range of motion and detection of deformities (conditions better known as "knock-kneed" or "bow-legged"). You will be asked to describe the pain in your knee. Your physician will also record your medical history, often asking you a series of questions about injuries, infections, ailments you have experienced and any medications you are taking. From this information and examination, your physician will choose the most appropriate treatment option. Q. What are some of my treatment options? A. Once your doctor diagnoses osteoarthritis, you should discuss with him the possible treatment options and which alternative best suits the severity of your condition. Joint and muscle exercises to improve strength and flexibility. Anti-inflammatory drugs for degenerative joint disorders. Synovectomy (surgical removal of inflamed synovial tissue). Osteotomy (reshaping of the bones to shift stresses from diseased to more healthy tissue). Partial knee replacement (a unicompartmental knee can be used when only a portion of the joint is diseased). Total knee replacement (used when severe osteoarthritis of the joint is present). Q. 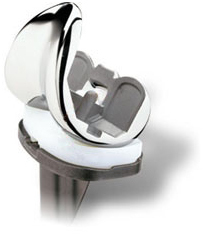 What is the NexGen® Complete Knee Solution LPS-Flex Fixed Bearing Knee? A. 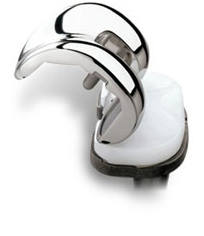 The NexGen LPS-Flex Fixed Knee is the latest in total knee replacement options from Zimmer. The Flex Fixed Knee is specifically designed to safely accommodate flexion of up to 155 degrees. Generally, knee replacements have been designed to accommodate flexibility up to 125 degrees. A. Flexion is the action of bending a joint, such as your knee or elbow. The opposite motion is extension, which is the act of straightening a joint, such as the knee when you are standing. Q. How much flexion do I need? A. Your need and desire for high flexion may be dictated by your favorite activities or cultural background. Many daily activities require the ability to bend the knee beyond 125 degrees. Climbing stairs, for example, requires a range of motion from 75-140 degrees while sitting in a chair and standing up again requires a 90-130 degrees range of motion. Other activities, like gardening, playing golf or kneeling for prayer involve motions that require up to 130-150 degrees of flexion to perform. Q. What is the benefit of the Flex Fixed Knee? A. The Flex Fixed Knee is specifically designed to safely accommodate up to 155 degrees of flexion in patients who had this ability before surgery. This means that with appropriate rehabilitation a patient can resume an active lifestyle after total knee replacement - deeply bending the knee for recreational, religious and other day-to-day activities. Patients today want to continue their previous lifestyles - even after total knee replacement. 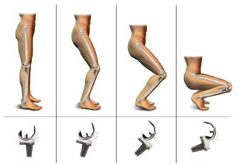 The Flex Fixed Knee may be an option for many patients to help them achieve this goal. Q. How do I know if I am a candidate for the LPS-Flex Fixed Knee? A. A number of factors can determine whether a patient is qualified to receive the LPS-Flex Fixed Knee. These factors will also help determine how successful the overall outcome will be. The ideal candidate will be one who is capable of fairly high flexion before the surgery and who is willing and able to undergo the rehabilitation (physical therapy) necessary to regain flexion after surgery. Other factors such as weight and activity level are considered in determining if the Flex Fixed Knee is the most appropriate implant solution. You should discuss this question with an orthopaedic surgeon to assess whether the Flex Fixed Knee is the best option for you. Q. How can I find a physician who uses the LPS-Flex Fixed Knee? A. To find the closest physician in your area who can implant the Flex Fixed Knee, call the toll free number, 1-866-FIND-MIS or search this Web site for a physician in your region. Click on "Find a Doctor" section of the site to get a list of physicians in your area. Q. How can I find more information on the LPS-Flex Fixed Knee? A. Call the toll free number, 1-866-FIND-MIS to order free patient education materials from this site. Q. Is the surgery for the LPS-Flex Fixed Knee different than other total knee replacements? A. 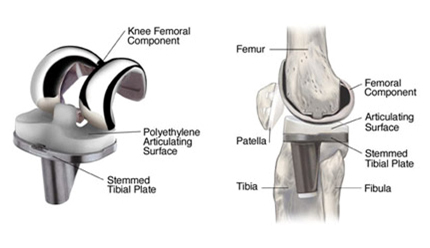 The surgery for the Flex Fixed Knee basically is the same as for other total knee replacements. You will first be taken into the operating room and given anesthesia. After the anesthesia has taken effect, the skin around the knee is thoroughly scrubbed with an antiseptic liquid. The knee is flexed about 90 degrees and the lower portion of the leg, including the foot, is placed in a special device to securely hold it in place during the surgery. Usually a tourniquet is then applied to the upper portion of the leg to help slow the flow of blood during the surgery. An incision is then made that typically extends from just above the knee to just below the knee. The incision is gradually made deeper through muscle and other tissue until the bone surfaces are exposed. The damaged bone surfaces and cartilage are then removed by the surgeon. Precision instruments and guides are used to help make sure the cuts are made at the correct angles so the bones will align properly after the new surfaces (implants) are attached. Small amounts of the bone surface are removed from the front, end, and back of the femur. This shapes the bone so the implants will fit properly. The amount of bone that is removed depends on the amount of bone that has been damaged by the arthritis. An implant is attached to each of the bones. These implants are designed so that the knee joint will move in a way that is similar to the way the joint moved when it was healthy. The implants are attached using a special kind of cement for bones. 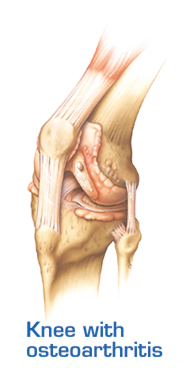 If necessary, the surgeon may adjust the ligaments that surround the knee to achieve the best possible knee function. Q. Are there special pre-operative exercises I should do before a total knee replacement with the LPS-Flex Fixed Knee? A. Your doctor may recommend that you try and do some exercises in the weeks before surgery to help condition your muscles to support flexion when the new joint is implanted. Talk with your doctor to learn if he or she has any recommendations. Q. What kind of rehabilitation program should I expect after the LPS-Flex Fixed Knee is implanted? A. Since rehabilitation is crucial to a successful outcome, your doctor may recommend an early and aggressive rehabilitation regimen after surgery and after you leave the hospital. After discharge, your physician will refer you to a physical therapist. Your therapist will work with you to help you regain your strength, balance and range-of-motion. Your commitment to following proper prescribed home exercises and additional rehabilitation is critical to the success of the surgery. If your are experiencing any or all of the following symptoms associated with osteoarthritis of the knee, talk to your doctor about how you can continue "Keeping pace with life." Do you experience aching in your knees followed by periods of relative relief? Do you experience pain after extensive use of the knee? Are you experiencing loss of mobility in your knees? Do you experience knee joint stiffness that tends to follow periods of inactivity such as sleeping or sitting? Does your knee pain seem to increase in humid weather? In a healthy knee joint, the surfaces of these bones are very smooth and covered with a tough protective tissue called cartilage. Osteoarthritis causes damage to the bone surfaces and cartilage where the three bones meet and rub together. These damaged surfaces can eventually become painful. There are several ways to treat the pain caused by osteoarthritis. One way is a total knee replacement surgery. The decision to have total knee replacement surgery should be made very carefully after consulting your doctor and learning as much as you can about the knee joint, osteoarthritis, and the surgery. In some cases, the Flex Fixed Knee may be an option for total knee replacement. The basic surgical procedure for the Flex Fixed Knee is the same as for any other total knee replacement. In total knee replacement surgery, the bone surfaces and cartilage that have been damaged by osteoarthritis are removed and replaced with artificial surfaces made of metal and a plastic material. We call these artificial surfaces "implants," or "prostheses." The patient is first taken into the operating room and given anesthesia. After the anesthesia has taken effect, the skin around the knee is thoroughly scrubbed with an antiseptic liquid. The knee is flexed about 90 degrees and the lower portion of the leg, including the foot, is placed in a special device to securely hold it in place during the surgery. Usually a tourniquet is then applied to the upper portion of the leg to help slow the flow of blood during the surgery. Small amounts of the bone surface are removed from the front, end and back of the femur. This shapes the bone so the implants will fit properly. The amount of bone that is removed depends on the amount of bone that has been damaged by the osteoarthritis. The implant that fits over the top of the tibia usually consists of two parts. A metal baseplate fits over the part of the bone that was cut flat. A durable plastic insert is then attached to the baseplate to serve as an articulating surface between the baseplate and the metal implant that covers the end of the femur. Artificial knee implants come in many designs. The surgeon will choose the implant design that best meets the patient's needs.